One of the most compelling personalities to grace the pages of this blog is Aunt Rose. Readers from around the world responded to her with admiration and even awe. Aunt Rose passed at 6:15 this morning. She was 107 years and 9 months old. Her daughter True, who’s worked tirelessly to care and comfort her mother, was by her side. As were her son George (“Sonny”) and son-in-law Devon. As a family, we can’t thank them enough, and their sibling Goldie – and many other family members – for their care and attention to Aunt Rose. True to form, our last conversation took place when Aunt Rose asked her niece Glenor to phone me late one night recently so she could say goodbye. After the call ended, a flood of memories washed over me. I’m sharing two things she told my husband when he asked her, at age 100, the secret to her long life. “Never go to bed angry”, she said. Thank you again, Aunt Rose, for these and many other pearls of wisdom. Rest in peace. Now we will never get to flirt. Aunt Rose would undoubtedly have flirted with you, Tim. She liked a good-looking man with a sense of humour – and charm. My condolences on the loss of your beloved Aunt Rose. Thank you for sharing her with me through your Blog. She was a great inspiration. She looked great at her 100th Birthday & to get another 7 years! That’s what the really call brata. God Bless & comfort you all at this time of sorrow. Thank you, Anne-Marie. How well stated. Brawta is a great word indeed. She got an extra dollop of grace in her abundance of years, and we got the abundant grace of her love and wisdom. 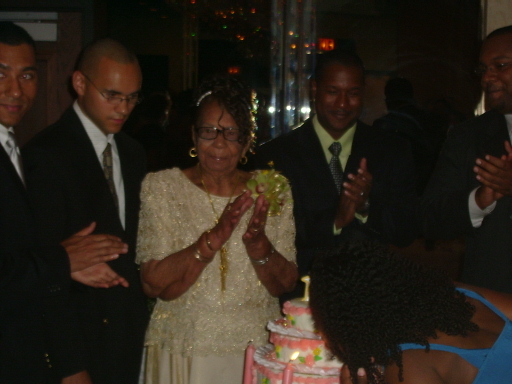 A life well lived…….Bon Voyage Aunt Rose. Thank you so much for this note, Beverley. It’s a thoughtful, uplifting and kind note, and we appreciate it. I knew Mrs. Wills and her family from Jamaica and I was a teenager. Sonny and I grew up together. They were a part of my own family and I was a part of their family. We will miss Mrs. Wills. Sadly missed but not forgotten. She sure did. A remarkable woman. Goli and I have known Rose for over 10 years, and the imprint she has left on our hearts is timeless and truly a gift. Some of our favorite memories include her 100th birthday celebration. I remember her vibrant and lively spirit filled the room for the whole evening. Having Rose at our daughter’s wedding, about five years ago, is another favorite memory of ours. We would visit her at every Christmas and she undoubtedly always had smiles, few but beautiful words of wisdom, and a warm heart. Rose was an exceptionally beautiful person inside and out and she never failed to warm our hearts. The world lost an inspiring woman, but there is a new angel watching over us. From the above comments it is crystal clear that she has touched so many lives and she will always be remembered by her loved ones. What a kind and interesting note, Methi. Thank you for it. I’m glad you and your family have these lovely memories of Aunt Rose.